Sometimes it's good to be a tourist in your home area. 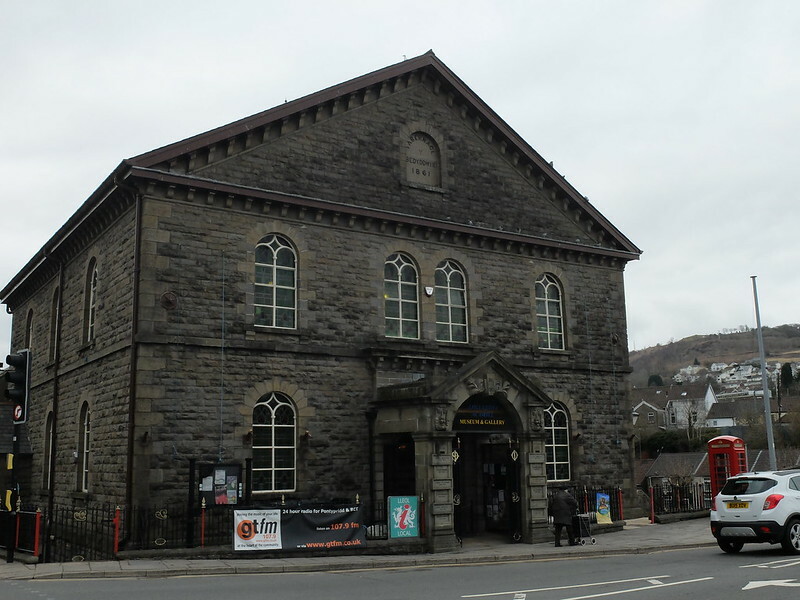 Despite being regular visitors to Pontypridd, neither my husband nor I had been to Pontypridd Museum. On noticing an advert mentioning their suffragette exhibition we decided to put that right. 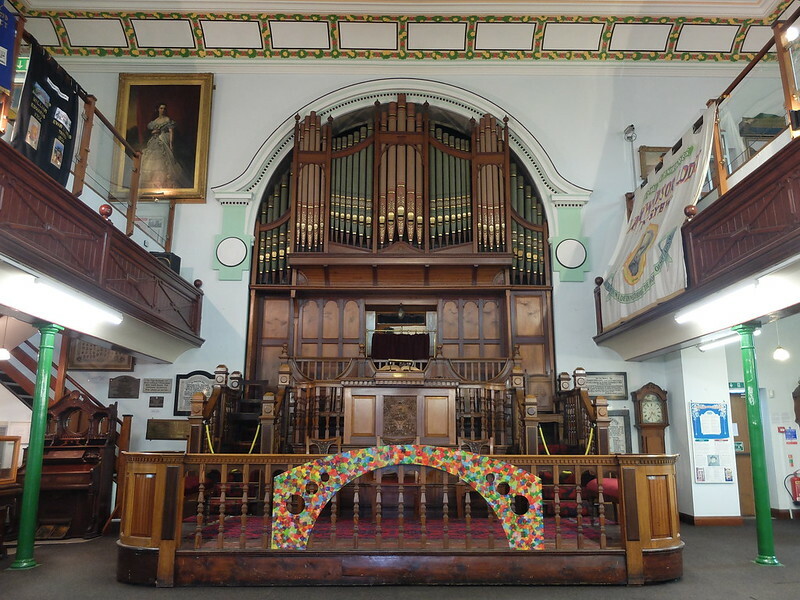 The museum is in a former chapel, and the original organ presides over the building with its impressive and ornate wooden dais. Despite the grey stone exterior of the chapel, inside it's fairly light, with beautiful stained glass windows and a fabulous ceiling. Like many chapels of its type, there is a galleried landing running around the outside of the main room. Hung from this are many union banners reflecting past workers' strikes from mining and the railways. The suffragette exhibition is very small, relating only to local interest in its scope, but was fascinating none the less. There were many local women (and a few men) who campaigned for voting reform, including a Viscountess who tried to blow up a post box in Newport and ended up in jail. Alongside stories of how the suffrage movement played out locally, there was a timeline of key moments in history. It really struck home how recently many of women's current freedoms were actually achieved, such as women not being able to take out a loan in their name until 1980, and equal pay only becoming law in the 1970s. 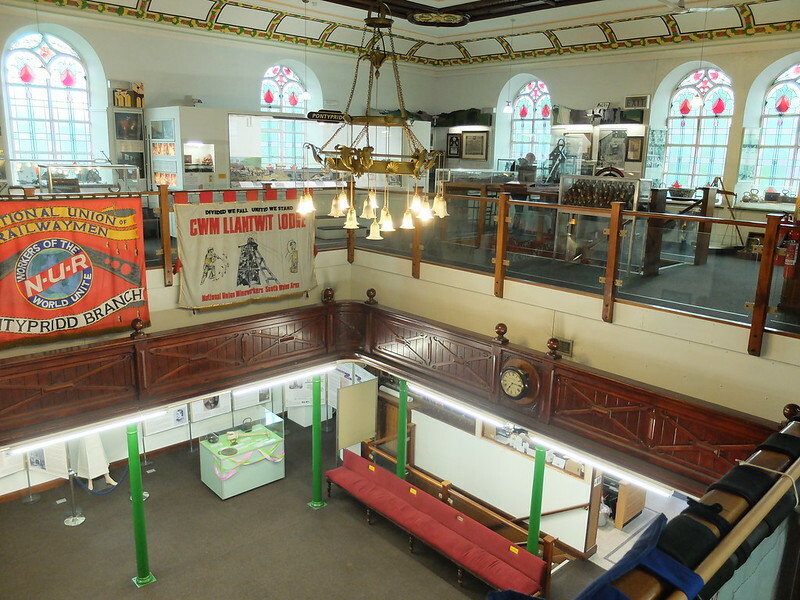 Elsewhere in the museum there is an eclectic selection of displays, relating to everything from the railways, to art, to boxing and to Tom Jones (of course). We didn't have enough time left on the car parking to look at it all in depth, so we'll have to return another day. 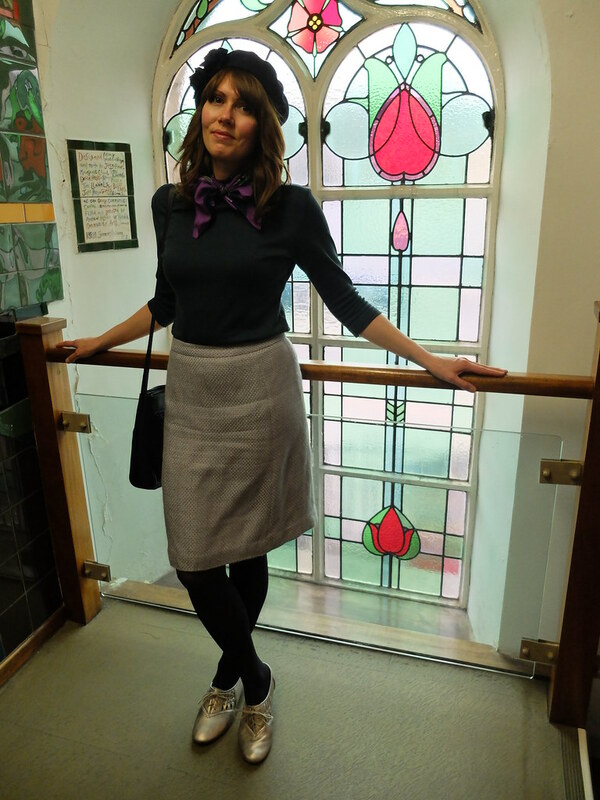 I wore a comfortable and sensible outfit for walking around the town, including my indispensable slashneck top from Vivien of Holloway, and a neck scarf (in suffragette colours). I would wear something very similar to work, except probably switch the shoes for something less casual. 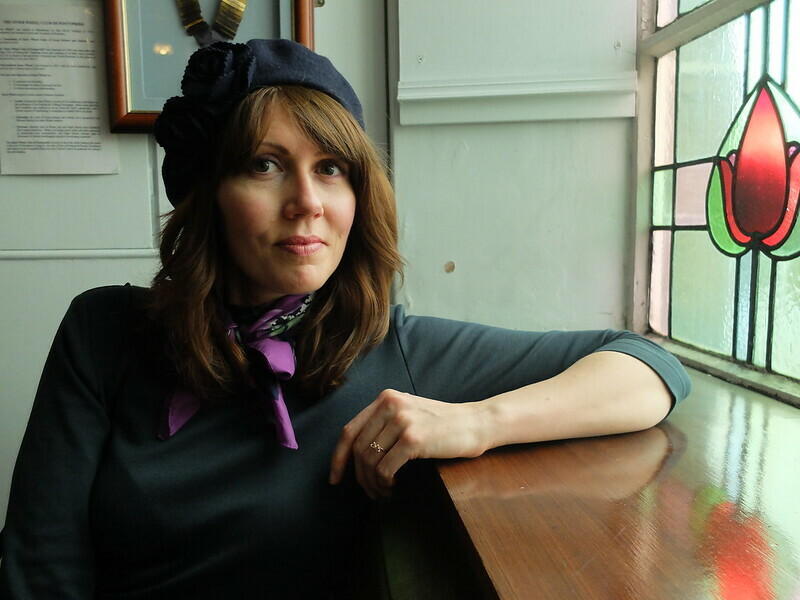 It feels a bit French, with the beret and neck scarf, but that's never a bad thing. Slashneck top from Vivien of Holloway, vintage neckscarf (gift), Accessorize beret, Oscar by Oscar de la Renta skirt (charity shopped), M&S tights, Clarks brogues, bag (charity shopped). Have you been to your local museum? I wonder what hidden treasures we all have within a stone's throw of where we live! Have you lost some weight? You're looking very svelte. I am a huge fan of playing tourist in your hometown! It is always fun! And this place certainly looks interesting! Love your outfit, so chic! Looks like a great place to visit! I love those stained glass windows. 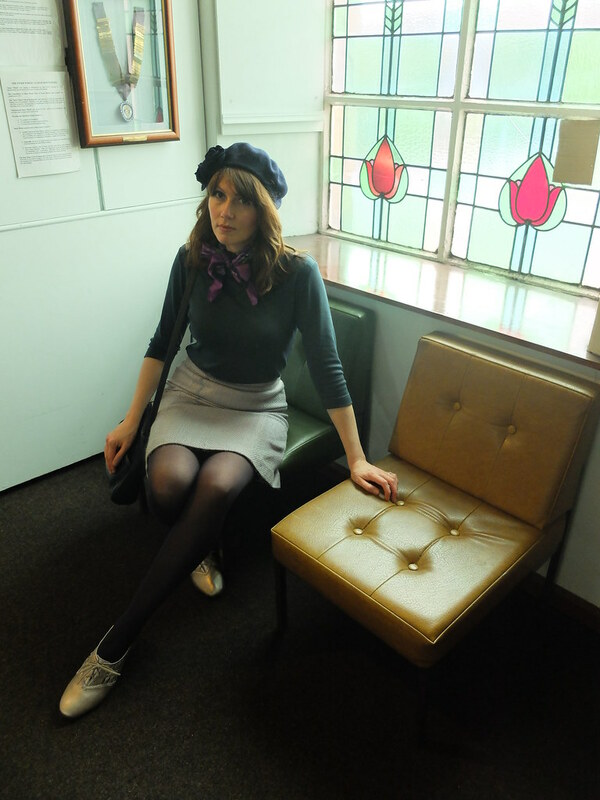 This casually chic outfit looks great on you, and I really like the Parisian touches with the beret and scarf. Chicago has some amazing museums! I still have quite a few to check off the list, to be honest. What a lovely museum. The stained glass windows are beautiful. I love the outfit you are wearing. That's a really lovely museum. It's always interesting seeing how the local, national and international intersect - such as with the arsonist Viscountess. I love that they turned a chapel into a museum. 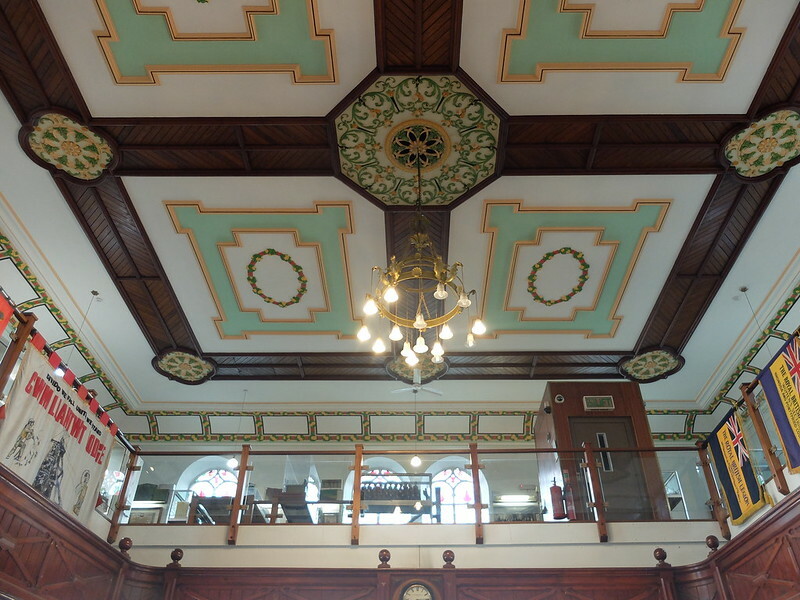 It's a great use that allows them to keep original features, like that impressive organ! I love it. We have a local museum and I've never been, in 8 years or so of living here. Oops? And it's at the train station, so I've been close to it a lot of times. I really should give it a try. I'm a big fan of being a tourist in my own town, too - I get so exasperated by people moaning about Walsall when they've never even been to the Leather Museum or the New art Gallery. I like the look of Ponty's museum and am very glad Sir Tom gets a mention. I love the nod to the suffragette colours in your outfit! This looks like quite an interesting museum to visit.